Skill transfer represents an important issue in surgical education, and is not well understood. 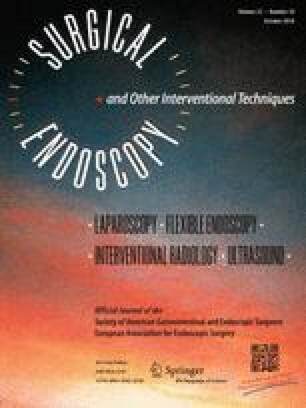 The aim of this randomized study is to assess the transferability of surgical skills between two laparoscopic abdominal procedures using the virtual reality simulator in surgical novices. From September 2016 to July 2017, 44 surgical novices were randomized into two groups and underwent a proficiency-based basic training consisting of five selected simulated laparoscopic tasks. In group 1, participants performed an appendectomy training on the virtual reality simulator until they reached a defined proficiency. They moved on to the tutorial procedural tasks of laparoscopic cholecystectomy. Participants in group 2 started with the tutorial procedural tasks of laparoscopic cholecystectomy directly. Finishing the training, participants of both groups were required to perform a complete cholecystectomy on the simulator. Time, safety and economy parameters were analysed. Significant differences in the demographic characteristics and previous computer games experience between the two groups were not noted. Both groups took similar time to complete the proficiency-based basic training. Participants in group 1 needed significantly less movements (388.6 ± 98.6 vs. 446.4 ± 81.6; P < 0.05) as well as shorter path length (810.2 ± 159.5 vs. 945.5 ± 187.8 cm; P < 0.05) to complete the cholecystectomy compared to group 2. Time and safety parameters did not differ significantly between both groups. The data demonstrate a positive transfer of motor skills between laparoscopic appendectomy and cholecystectomy on the virtual reality simulator; however, the transfer of cognitive skills is limited. Separate training curricula seem to be necessary for each procedure for trainees to practise task-specific cognitive skills effectively. Mentoring could help trainees to get a deeper understanding of the procedures, thereby increasing the chance for the transfer of acquired skills. Cui Yang, Uljana Kalinitschenko, Juergen Weitz, Christoph Reissfelder, Jens R. Helmert and Soeren Torge Mees have no conflict of interest or financial ties to disclose.